The saying “getting there is half the fun” seems tailor made for Silverton, Colorado. However you choose to get here, be prepared for an incredible travel experience. Approaching from the south, you can reach Silverton’s 9,318 mountain elevation on one of the world’s greatest train journeys. Or from the north, take one of the world’s most exhilarating drives along the Million Dollar Highway, as we did from Ouray. But getting to Silverton really is only half the fun. Exploring this old mining town’s boisterous past is the other half. Old west style architecture still dominates the city’s often dirt roads and tells the tale of a town once divided. It is often said of 19th century mining settlements that the first building constructed in town was a saloon. At its peak, Silverton is reported to have had 29 such establishments, along with an equally large number of gambling halls and houses of ill repute. An imaginary line running down Greene Street separated these businesses from the more respectable parts of town. 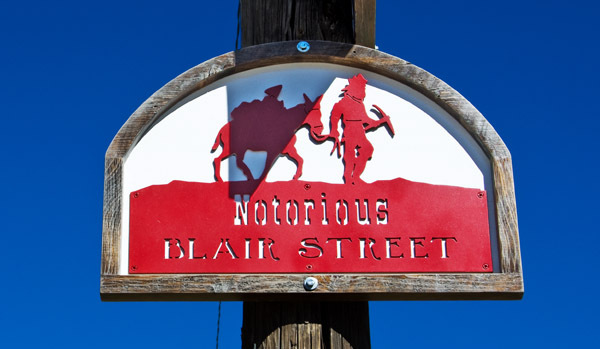 The four blocks of “Notorious” Blair Street is where all the action was. While technically illegal, gambling and prostitution were largely tolerated in the early days of Silverton, as long as they stayed behind the Greene Line. Ladies of the night were even charged a $5 monthly fine that contributed nicely to the town’s coffers. “Respectable” politicians may have lamented lascivious behavior, but not so much as to refrain from profiting from it. The gold rush eventually ended, the mines lost their luster, and once raucous Silverton started to settle down. “By the 1940s, most of the gambling was gone and the ‘soiled doves’ had moved on, citing competition from the local girls who ‘gave it away’ in fits of patriotic fervor during WWII,” says historian Beverly Rich. Today, Silverton is a bastion of family wholesomeness providing travelers with a wonderful base to explore the area’s all-season outdoor activities. 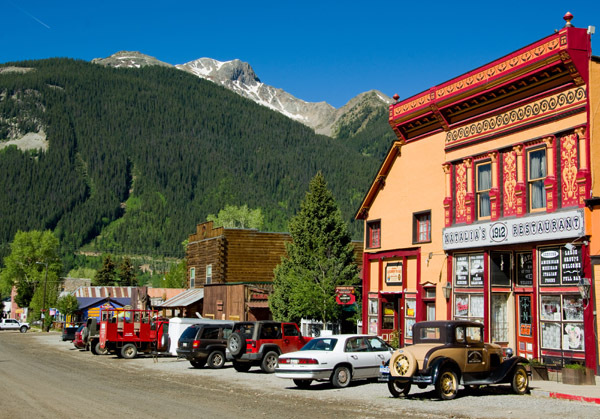 The historic streets and buildings, however, still tell the colorful story of its “notorious” past for anyone wanting to delve into Silverton’s darker side. Love that local competition closed down the ‘soiled doves’. Does look like a fine place to visit. It’s a great line. I wish I had written it. I don’t know how many times I’ve been up and down The Million Dollar Highway, but it’s always a thrill. Silverton has changed in the last 10 years–used to be no paved roads. Still no traffic lights! I think just the one main street is paved even now, but I could be mistaken. Thanks from a “part-time wanderer” for that article which for me is a wonderful suggestion for a place that has now gone on my bucket list of travel destinations! Glad to be of service. Thanks for stopping by and sharing your thoughts. Loved the fact about ‘notorious’ Blair St. We had one of those and the most notorious house was No 10 Downing St residence of Tony Blair…..he drove a coach and horses through our judicial system, our government organisations and unwritten constitution!! Not to mention a small war in Iraq! Sounds like an excellent place to visit. Old west architecture, mountain views and the ”notorious” Blair Street:-) And if there is a train journey to get there definately a place to go to….train journeys are always a great way too travel. The imaginary line running down Green Street – could that be a clue to the origin of the saying crossing the line (when you have done something wrong or questionable, you crossed the line)? There is an old cemetery between Silverton and Ouray that is most interesting to walk through. The early miners had very difficult lives, and many died young. Some of the tombstones were unique. I have a picture of one that is a log. Some have really neat says, too, and there’s a special section for veterans between some beautiful flowering shrubs. What a cool place (and I love the two pictures you used). Reminds me of how there are a lot of gold rush towns in my own backyard (northern BC) that I’d love to visit. Yeah, touring our own backyards is a great and easy thing to do that many people overlook. i love Silverton! I’m from Colorado originally and so it’s fun to see your adventures there! thanks for stopping by my little slice of blogland. I am really enjoying exploring your blog! Really good travel writing–informative, but with some personality. I like the angles you take. Thanks for liking my last post at The Preface; I figured I’d check out one of yours. Glad I did. Keep traveling and thanks for sharing. We love visting Colorado. It certainly seems to us one of the better places to live to. Enjoy! What a beautiful and quaint town! I’ve only passed through Colorado, but whenever I go back, I would love to see this place. Great photos!